This is Go-To Girl: Tongue Tied After Popping Cherry? Read This. Tongue Tied After Popping Cherry? 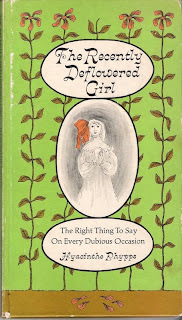 Via Found_Objects, this hilarious book details the proper etiquette for a lady who has been deflowered in any number of different ways. The poster claims that it was published in 1965; I don't care about its authenticity but it sure is funny. Late at night on cross country bus, you are embarrassed by seizure of hiccups that disturbs other passengers. Man in adjoining seat helpfully says: "I've heard of a sure-fire cure for hiccups." After deflowerment, you say, "Thanks, my hiccups are gone." He says, "It always works." You say, "Yes, but now I'm getting car sick." Some people are bad travelers and nothing can be done about it. Just in case you're anticipating an upcoming deflowerment, read up on the proper thing to say afterwards.